Hey Terrea! How are you, you gorgeous thing you? Am remembering you singing at the Garret. How lovely it was. So happy to have found this site. Scarry pics of our projects. Is there an update on Terrea's condition? I have stayed in S. Cal and teach now. How the hell are you? I'll always cherish the memories of you and B.J., the Garret being in my "front yard", and the evenings spent listening to your warm, rich voice. Along with many others, I thank you for the Garret. I just found one of my Terrea Lea Albums. This is one I bought at the Garret in the 60's. It's the white one with a drawing of Terrea on the right side. It's in very good shape. Do you need it? I have been searching for any info about Jo Mapes. Found referneces to this site on MudCat Cafe and, sure enuff, there are 2 entries! I have heard that she is living in the Chicago suburbs---a far cry from her Crilly Court digs in the 60's and 70's! I still her her Kelloggs commercial for Raisin Bran in my mind once in a while!!! Great Voice, Great Gal! It is really great to find this site. I enjoyed going there in the early 60's with Yvonne Seifert/Siefert [aka: Darren Taylor] who introduced me to the Garrett and the wonderful music and people there. Perhaps someone remembers Yvonne as a person, [HHS graduate] or as an entertainer in the Hollywood/North Hollywood area. Please let me know if you do know how she is doing. I still have my "Terrea Lea at the Garrett" album which I break out every few years so I can get depressed about how time flies and music regresses in quality :-). What a hoot. A friend told me about the web site. I was an employee for a short while. For a long time I was a regular client. I remember burning pizzas, filling the place with smoke and the smell of burned bread and the never ending games of pool. What incredibly fond memories. I hope you are feeling better and recovering quickly. I first started singing at the Garret when I was just a skinny 17 year old runaway from Hometown, Illinois, fresh on the streets of Hollywood...green as the grass & borrowing guitars and soaking in the magical musical scene that was going down all over Hollywood. How well I remember the tiny stage and mics..the pool tables..the round fire place..and the comradary of the performers. (LOL)I was pretty horrible back then, but you have to start somewhere, and Terrea's wonderful little club helped me refine my talent and afford me the chance to get up there and sing to a real audience. Afterwards, my gorlfriend Charlotte and I would hit Canters for a late night breakfast..or maybe catch a silent movie at the old Silent Movie Theater just down the street. I cherish those times and will always be grateful for the opportunity Terrea and the Garret afforded me with. God Bless you and the Garret, Terrea.....get well. I am now retired and living in Attalla, Alabama. I was updating my journal about my eclectic musical experiences & recalled hanging out at Cosmos Alley when Stan Wilson owned it & spending much more time at the Garret. I've lost my Terrea Lea vinyls & found this site trying fill in memory lapses. I spent many Friday & Saturday nights at the Garret. I recall how Terrea would pause her songs to let the cappucino machine shriek. I have been looking all over the web for a song I heard Jo do while in Alaska about 1961 on an album. The song was "Baby,Let Me Follow You Down" and I also used to enjoy her in a Denver club. Am I dreaming about the album? looking for anyone who knew Lorna Wall during her short life. She was around the Garret alot in '58, '59, '60. thanks. We've been trying to find you since you abandoned us here in the West Valley. My friend Fred and I were thinking about doing some old Sam Cooke numbers, and no one can play them like you. This Saturday night, we are having a kick out the jam party at Fred's and you should be here, guitar in hand. Email me at the address listed when you get this. Hey Terrea Lee...I still can't believe that I managed to back out of that drive way, It was four feet wide, right? How are you? Wes & Karen's mailing address is now 24 North Woodland Rd, Lakeside, Arizona, 85929. Phone number is (928)368-5852. Anybody know whatever happened to John Cote? (Not spelled John Coty, which is how it is pronounced. Wow, what a beautiful walk down memory lane! 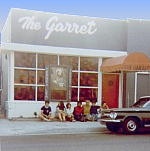 I frequently went to the Garret during high school (graduated Fairfax High in 1963) and after, and I remember the wonderful Terrea Lea music, the warmth of the fireplace, and the delicious cappucinos. Thanks for the memories! About 1961, I fell in love with Terrea's music, her sound, and the wonderfully empathic feelings at the Garret: a truly unique experience - far more profound than other places. With Terrea, I recorded, produced, edited and masterer her album, "At the Garret circa 1961. I may still have the masters (not certain). Thank you, Terrea, for your wonder..... I miss those times.